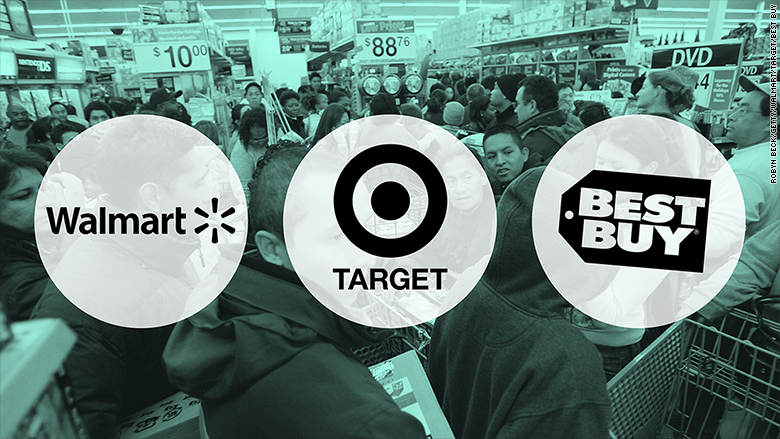 Walmart, Target and Best Buy have rolled out their Black Friday plans. Target (TGT) will open its doors at 6 p.m. on Thanksgiving Day. Best Buy (BBY) stores will open an hour earlier at 5 p.m. Best Buy will also close at 1 a.m. early Friday and reopen at 8 a.m.
And Walmart (WMT) will start a Black Friday event at 6 p.m. on Thanksgiving. Most Walmart stores are open 24 hours. All three major retailers are also announcing expanded plans for digital and in-store deals. Walmart says the majority of its Black Friday deals will be available on its website starting at 12:01 a.m. ET on Thanksgiving. It's advertising HDTVs from $125 to $398, drones for as little as $30 and more than 750 DVDs and Blu-ray movies starting at $1.96. Best Buy is offering hundreds of dollars in savings on Macbook Airs and DSLR cameras. The company is also selling video games for less than $30 and the Fitbit Charge 2 for less than $130, savings of $30 and $20, respectively. Target, meanwhile, is offering a selection of deals through Thursday, including 30% off shoes and 25% off Apple TV models. The company says it is also bringing back its 10 Days of Deals and Black Friday Presale promotions.